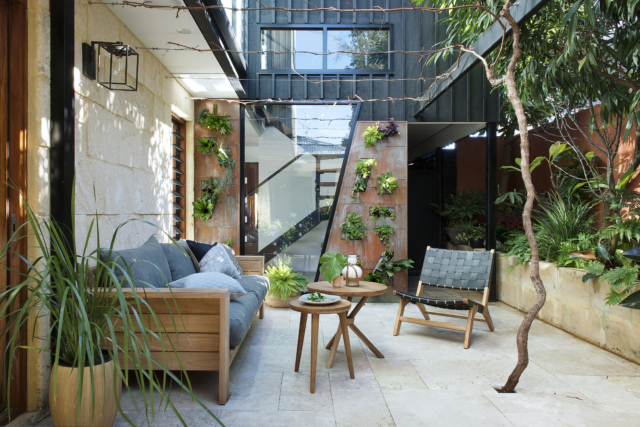 When you’re a leading light on the Australian landscape scene, it makes sense that greenery is the hallmark of your home. 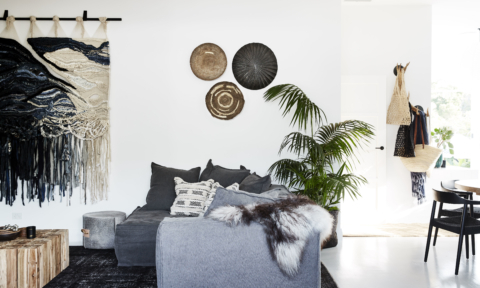 Located in the Perth seaside suburb of Scarborough, this recently renovated home houses exterior stylist and landscaper Ascher Smith, her husband Dylan and their two young sons Hudson and Parker. 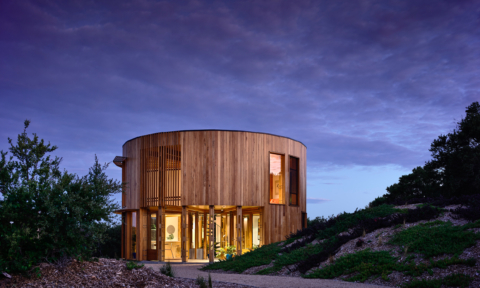 “The design brief to our architect was to for them to design a modern addition, with the use of natural timber and black steel elements on the exterior with a crisp, minimal interior design ​so we could create a style in the interior that was a reflection of us. 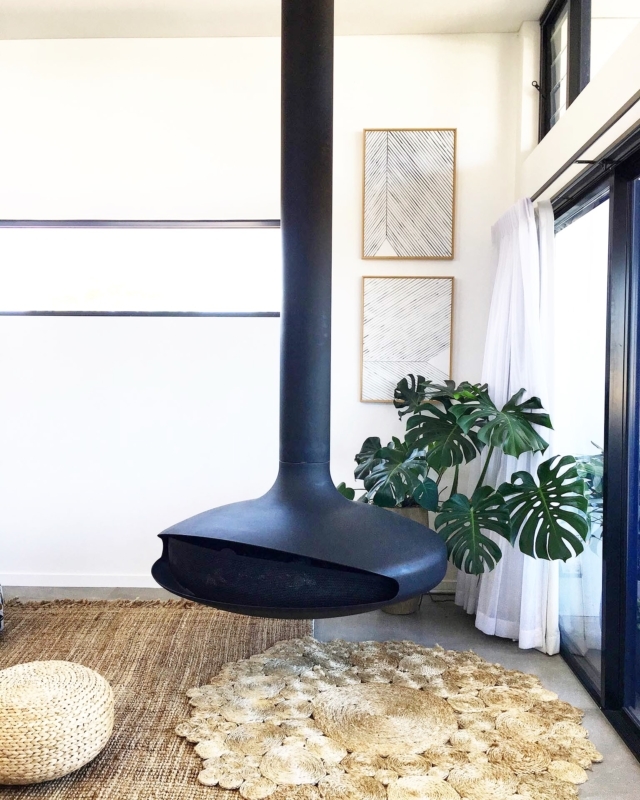 We had fun decorating with all of our collected pieces over the years, and it always feels like home because of it,” says Ascher of her home that was originally a simple single storey residence and now boasts a second floor that takes in sweeping ocean views. 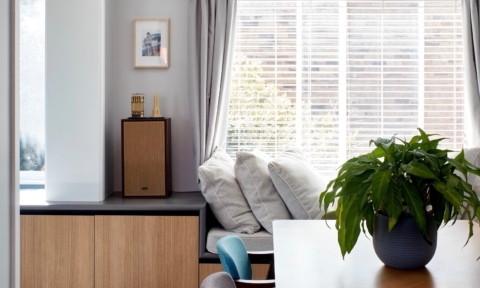 “I’d say our style was mid-century modern, ​with a dash of industrial. 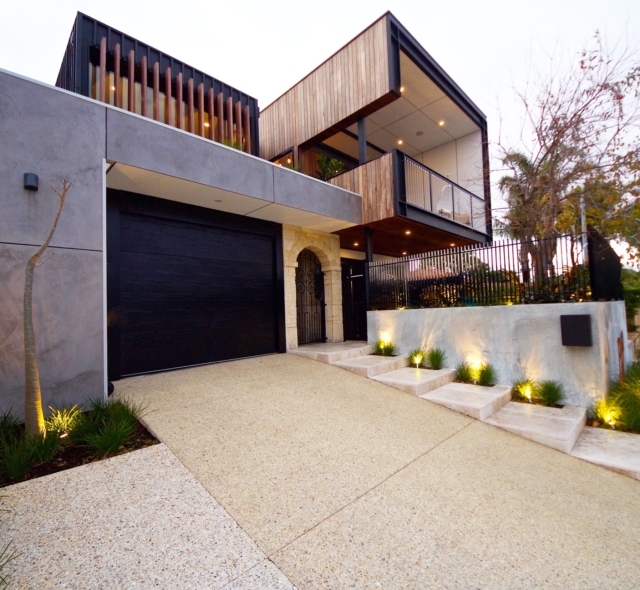 I’m obsessed with black and white clean lines but need the timber, natural stone or greenery to soften the look. 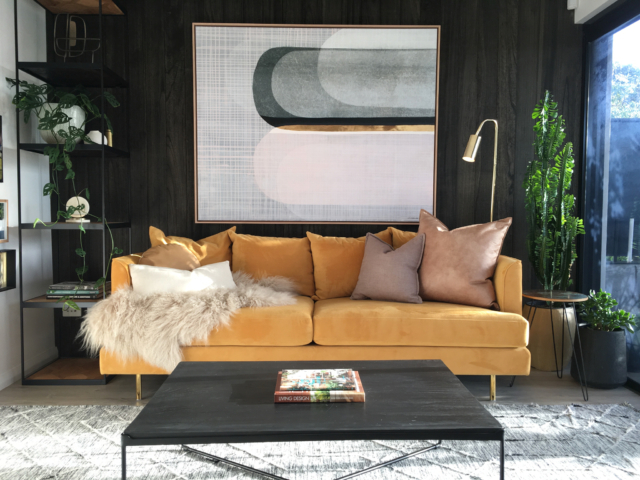 We know we are a couple that don’t do things in halves and both have very creative and artistic families, so when our quest began to create our dream home, we knew that the end result would be unlike most other houses you see,” says Ascher. 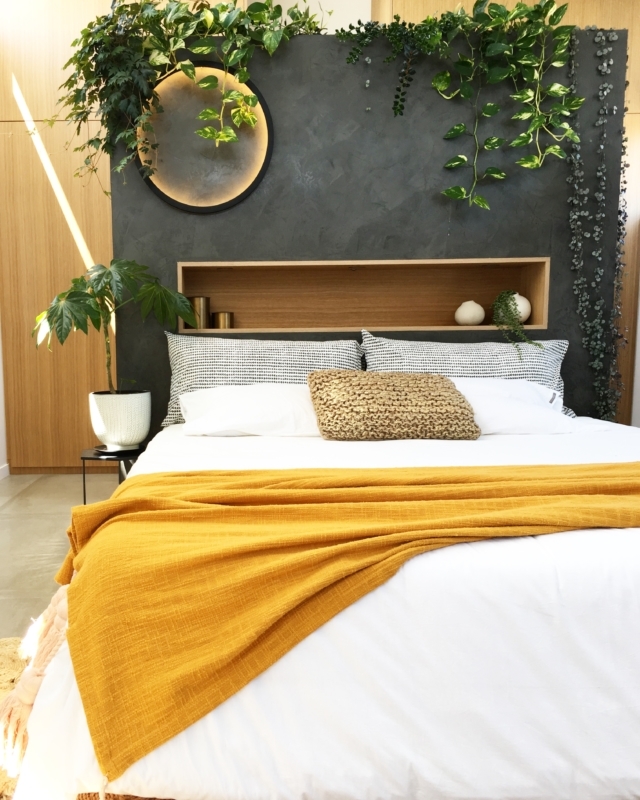 Master bedroom – now that is commitment to greenery! 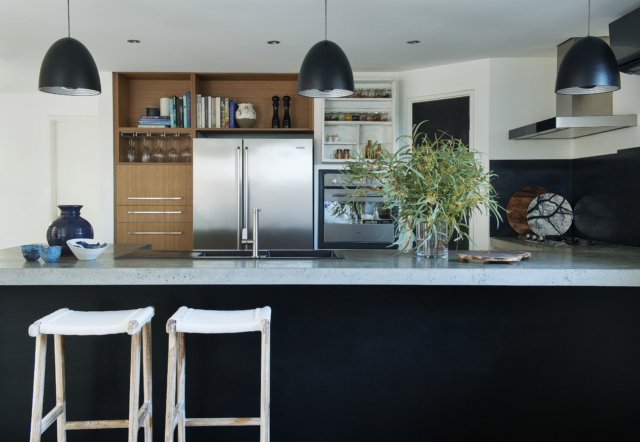 “When we renovated, we stayed within the footprint of the original home and added extra space by extending over out courtyards with hallways and a west-facing balcony. 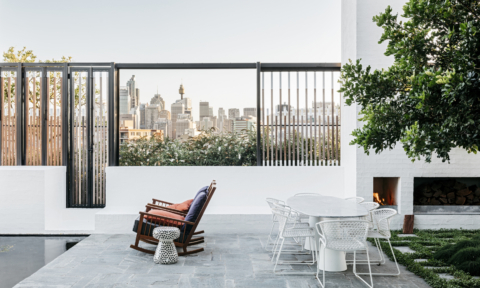 This way, we could keep our existing renovation downstairs and both courtyards and garden spaces, which were so important to try and maintain throughout the build,” says Ascher. “Our back courtyard has been the forever changing room in our house. 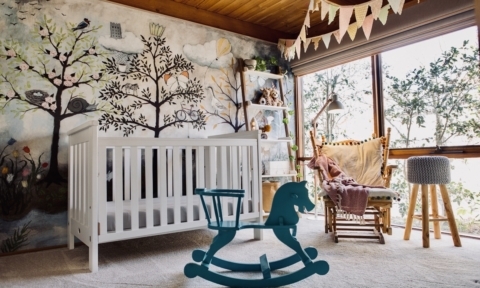 The once ugly unusable space has been an enchanting, secluded, lush green room that we can entertain or relax in no matter what time of year it is. 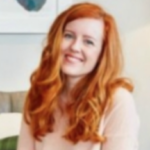 Seen from almost every room in our house, we have recreated a little Italy out there,” says Ascher referencing the pizza oven that takes pride of place. 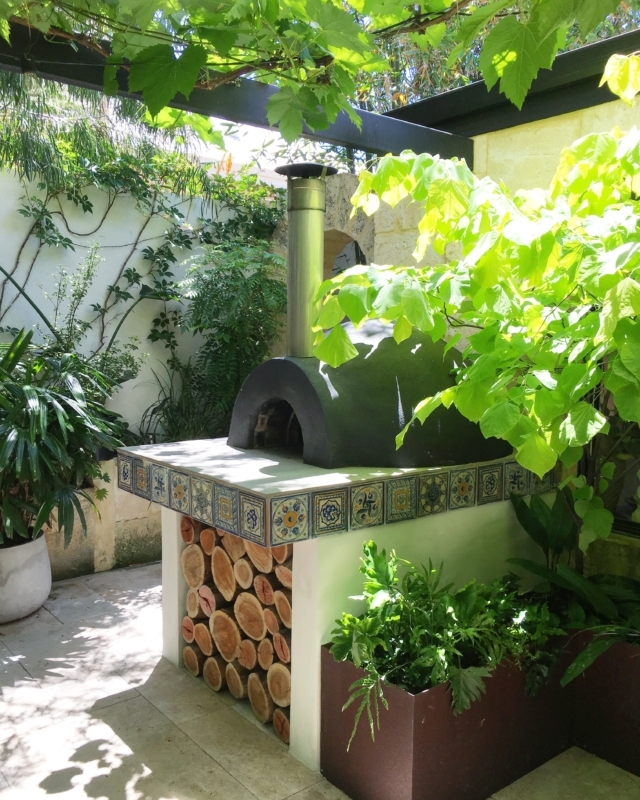 “Dylan makes the best pizzas in town right here in our backyard and my constant itch to redecorate, paint or move pot plants and furniture around allows this courtyard to change dramatically day to day,” says Ascher. 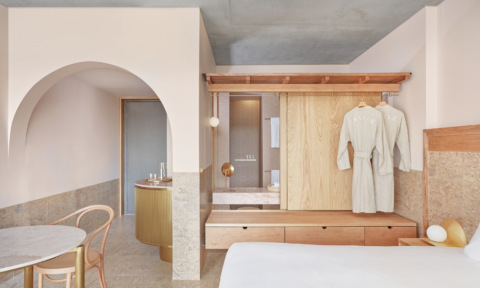 Large glass stacker doors connect the indoors with the outside and the courtyard features travertine paving and lush greenery. 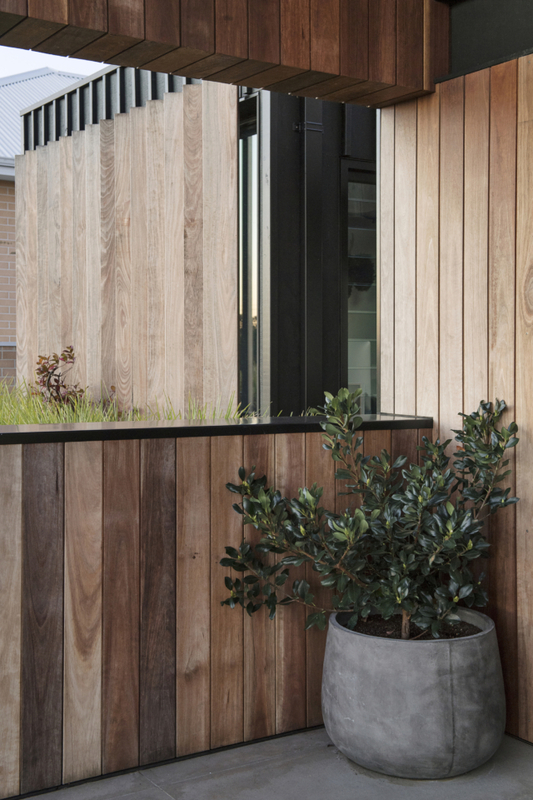 “The gardens are mass planted and provide us with year round screening, greenery and colour in the courtyards. We furnished the area with only a large teak sofa, some casual seating​ and the blue Tuscan pizza oven made by Dylan himself. 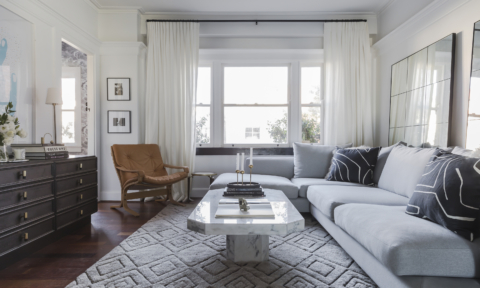 We were careful not to clutter the area with furnishings as they are still small spaces and you need places to rest the eyes,” says Ascher. 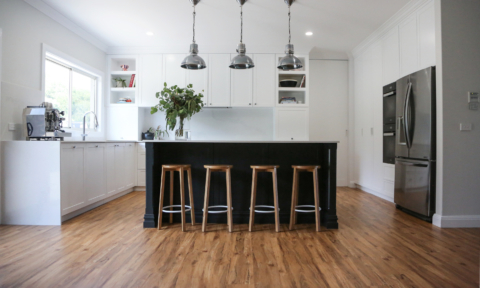 “We love how homely our house feels, even after our extensive modern renovation. There is always a comfortable chair to sit in, delicious food aromas that lead you through the front door, cheerful artwork and family photos in every room. I want our house to feel ‘homely’. 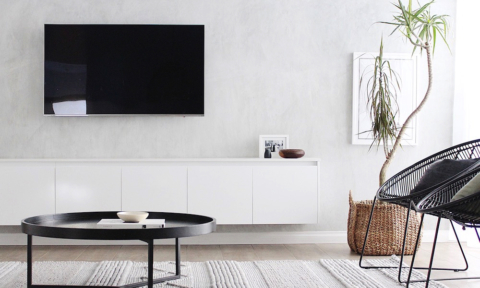 It’s what we both grew up with and it’s so important that our friends, family and children feel welcomed and comfortable in our space too,” says Ascher.